CEDAR CITY – A quick strike is always good. 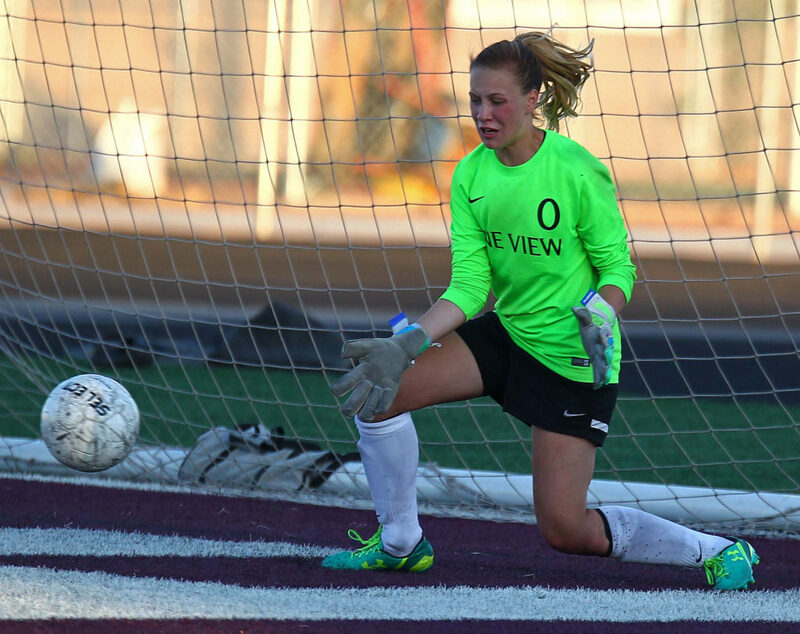 “We did good.” said Pine View’s Shaneice Lourenco, following the Panthers’ 3-0 girls soccer win over Canyon View on Thursday. “We came out and scored quick and intimidated them a little bit,” Lourenco said. She scored the first goal less than three minutes into the game and added another when she looped a shot over the Falcons goalie. Erin Callahan sandwiched a goal off Aubrey Day’s corner kick with 29 minutes left in the first half. “I feel like we were more talkative and we clicked more,” Lourenco said. The win is Pine View’s first of the season. While giving credit to Pine View, Canyon View coach Mark Comstock said his team didn’t play well in the first half. Comstock said that Allie Lloyd and MaKayla Mechem deserved praise for their play against the Panthers. The game was played under difficult weather conditions, with a strong, cool wind and rain dominating the pitch Thursday afternoon. Pine View, 1-4, has 12 days off before embarking on the Region 9 season with a Sept. 6 date at Snow Canyon. The Lady Panthers went 0-1-1 last season against the Lady Warriors. Canyon View, 1-5, plays at Dixie Saturday morning. Two Region 9 teams are in action Friday, with Hurricane at Spanish Fork and and Arbor View, Nev., at Snow Canyon. On Saturday, Arbor View is at Desert Hills, Hurricane is at Stansbury and Dixie hosts CV.